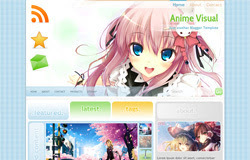 Template features : Wordpress Look, 2 Columns, Right Sidebar, Anime Style, Featured Content Slider, Fixed Width, Blue Background, Top Navigation Menu, Tabbed Widget. "thumb.jpg" with your thumbnail image. "image.jpg" with your slider image. Just replace "#" with your menu item URL.